This interview was published in Credo Magazine, volume 5, Issue 4, November 2015, pp. 8-11. 1. Did you grow up in the Catholic Church? If so, what drew you to become an evangelical Christian? My family was an ordinary Italian family, nominally Christian and devout to Saint Antony, but with little grasp of basic gospel truths. One day we were visited by a Swiss couple from the local evangelical church that was going door to door. They asked if we were Christians. The answer was “yes, of course.” They further asked if we had ever read the Bible. The answer was “no.” Catholics were not supposed to read the Bible. They then replied, “How can you be Christian if you don’t read what Christ has done for you?” It was as if a light was switched on in the darkness. It was the beginning of a journey that led my father to become a believer, then the rest of the family followed at different stages of life. 2. What is the main doctrinal divide, in your estimation, between Roman Catholics and Protestants? In Roman Catholicism the tendency is to idolize the church. The distinction between Creator and creature is blurred by way of conferring to the church what ultimately belongs to the triune God alone. The church is elevated to a position that makes it an idol, stemming out of a non-tragic view of sin, the conviction that in significant ways the church continues the incarnation of Jesus Christ resulting in an abnormally conflated ecclesiology. The great bullet points of the Protestant Reformation, i.e. Scripture alone, Christ alone, grace alone, are all biblical remedies against the idolatrous tendency of a self-referential church, which sadly have been rejected so far. 3. In your ongoing interaction with Roman Catholics in Italy, what approach have you taken and found to be effective when witnessing to them? Exposing them to Scripture as much as possible and not assuming they already grasp the basics of the gospel. They may know some Christian vocabulary, but it is generally marred, distorted by traditions and deviant cultural baggage. Most Catholics in Italy are of the “pick-and-choose” variety and so they blend unbiblical traditions and secular unbelief. It is also important to show the personal and the communal aspects of the faith in order to embody viable alternatives for their daily lives. 4. You have written a very helpful little book on the papacy. So tell us, what are positive and negative aspects of this new pope Francis? There is much sentimentalism about Pope Francis. He is a champion of the gospel of “welcoming all” and “showing compassion.” Many secular people, as well as many evangelicals, are fascinated by it. We should ask: What about repentance and faith in Christ alone? What about turning back from idolatry and following Christ wholeheartedly? What about putting the Word of God first? Some of the language of the Pope seems to resemble gospel emphases, yet the substance of it is still heavily sacramental and Marian, leaning towards a liberal form of Catholicism. He is the first Jesuit to become Pope and we should never forget that the Jesuit order was founded to fight against the Protestant Reformation by learning its secrets and using them against it. 5. Let’s address the elephant in the room: Is the Pope the Anti-Christ? Luther, Calvin, the seventeenth-century Protestant confessions, the Puritans, Wesley, Spurgeon, et al., believed that the papacy (not this or that Pope) is the institution out of which the Anti-Christ will eventually come. I share this broad protestant consensus. The papacy claims christological and pneumatological titles and prerogatives (e.g. vicar of Christ, infallible teacher, supreme head of the church with full, immediate and universal power), coupling them with earthly political power. Remember that Popes are monarchs of a sovereign political state. In the papacy what belongs to God and what belongs to Caesar tragically intermingle. This poisoned mixture is the potential milieu for the Anti-Christ to rise from. 6. You are a pastor of a Reformed Baptist Church in Rome. Is a church like yours extremely rare? How has the culture perceived your congregation? Evangelicals are 1% of the population in Italy and Rome is no different from the rest of the country. We still struggle with the centuries-long prejudice of evangelicals being perceived as a cult. What makes our church distinct is that it is confessional (holding to the 1689 London Confession of Faith and belonging to a Reformed Baptist association of churches), urban (impacting the cultural, political, media, and academic institutions of the city with the gospel), and missional (living to the glory of God in all vocations and initiatives). Unlike cults, we cherish church history and claim to belong to the catholic (not necessarily Roman Catholic!) church. Unlike cults, the gospel we believe in is for the whole of life. Unlike cults, we encourage constructive and critical cultural engagement. Thankfully, there is a growing number of churches like that. 7. Tell us about this new piece of property your church is purchasing. Why is this so exciting? 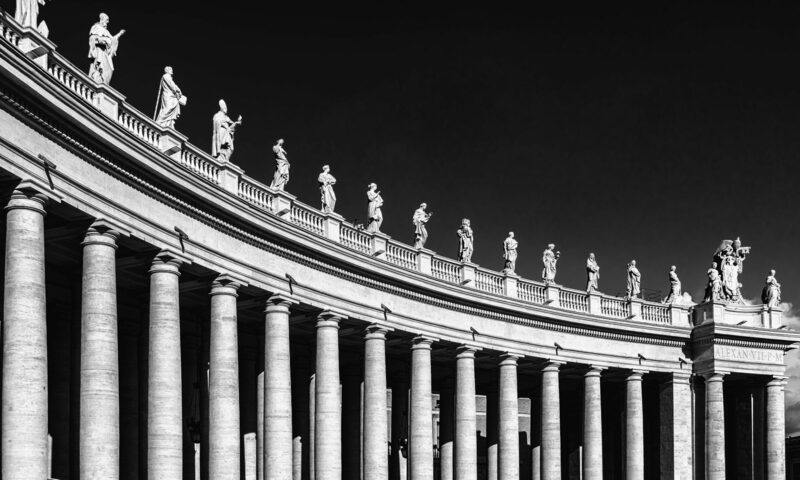 Because of the presence of the Vatican, Rome city center has been, until recently, a “heresy free-zone.” Non-Catholic initiatives were not welcomed, if not forbidden. The last property that evangelical churches bought in the central area dates back to 1920. After nearly 100 years we are sending the message that we love the gospel and we love the city. We want to be a gospel community right at the heart of it. Apart from hosting the activities of the church, the property will also function as a theological study center. With IFED (a Reformed theological institute: www.ifeditalia.org) we are providing outstanding theological training to lots of students. In Rome we will act as an outpost of evangelical theology, next to the Jesuit and the Dominican universities which are located around the corner! The space has the potential to become a springboard for gospel work in the city and beyond. For example, the Reformanda Initiative has just been launched (www.reformandainitiative.org). It aims at helping the world-wide evangelical church to relate biblically to Roman Catholicism. 8. If our readers get the chance to visit Rome, what two places must they see? Evangelical tourists should see the “dark” sides of Rome as far as religious freedom is concerned. For instance, Campo dei Fiori is a beautiful square next to the baroque Piazza Navona where Popes burnt heretics of all types, Protestants included. In the middle of Campo dei Fiori is an impressive bronze statue of Giordano Bruno recalling his execution that happened there in 1600 because he was a “free thinker” in an age and place where total submission to the power of the church was imposed. A number of Evangelical martyrs found the same destiny there. Another place to visit is Porta Pia where the Italian army entered the city and conquered it in 1870, thus ending the history of the Pontifical state. The Bible in Italian was forbidden in Rome up to 1870. It was through the breach of Porta Pia that the first Bibles printed by the British and Foreign Bible Society were smuggled into the city and freely distributed to the people. The tragic irony of Rome is that she is known as one of the cradles of Christianity, but the reality is that the Bible was a forbidden book for centuries. Generally, no tour guide tells you these stories or shows you these places. 9. Let’s get down to the important stuff: which football team should we be rooting for (that is, “soccer” for our American readers!)? In Rome there are two top teams: Roma and Lazio. People tend to be very passionate about one or the other or – should I say – one against the other! People stop talking to you if you happen to support the other team. I was not born in Rome, so I am excused to support Torino FC, which is not perceived as a rival to most Romans. In this way, I don’t run the risk of losing a friend for supporting the wrong football team! 10. If I have just one meal in Italy, what authentic dish should I order? Try “strozzapreti” (literally “priest stranglers”!). It’s a savory pasta dish, like thick and twisted macaroni. It can have various combinations with different tomato-based sauces. In popular culture, Roman Catholic countryside priests were teased because of their voracious appetites and impressive bellies. So this pasta was supposed to “strangle” them because of its thickness. The great Dante used the law of retaliation to punish people in the Inferno. Popular culture made a kind of pasta to punish greedy priests. A tasty reminder that no glutton will inherit the kingdom of God!